Headlines: Cooler evening temps have reduced the water temps to a much more fishable level and the fish are responding well to all techniques. It has rained well in the last 24 hours with Adaminaby receiving 52 mm. Hopefully this will see Lake Eucumbene continuing to rise for a time yet, and the rivers will have had a reasonable top up again too. Rivers:- The river fishing has been great in the streams. 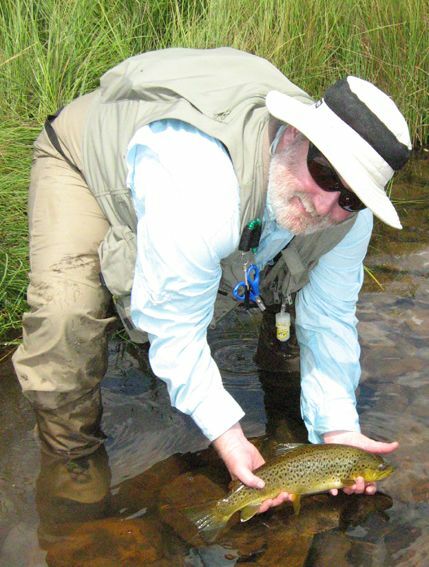 Still good water in all the high country rivers and streams, and plenty of hungry fish. Dusk is still the peak time but there have been some good reports from those searching with a Beetle, Hopper or Stimulator. Other flies to use are Blue Wing Olive parachutes, Klinkhamers, Elk Hair caddis and Adams Irresistable's. Lake Eucumbene:- The lake has risen again this week and much of the Love Grass that was proving a pain has gone. There is still some but nowhere near as bad as it was. The lake is looking fantastic at Buckenderra, Seven Gates, and Yens Bay with lush grassy bays. There is a heap of food in the water at present too with Damsels Nymphs, Corixa, Mudeyes, and Caddis being plentiful. Good numbers of Rainbows are cruising in the margins early and late and have been responding well to nymphs or small wets either cast and retrieved or drifted under a dry. The quality of these fish has been very good too and it is amazing how quickly the condition on these fish has improved. Hopper fishing is set to fire over the next few weeks. Burleying with live hoppers is a great way to get fish up on the surface on those bright, hot and sunny days. Once you get a fish up on the Hoppers you can cast an artificial one in the vicinity and the strikes are very visible and often aggressive. Lake Jindabyne:- Reports from Jindabyne have been scarce but evening and early morning should be a good time to find a few patrolling the edges. Stick Caddis, Olive Nymphs, Black Nymphs, Craigs Nightimes, Muddler Minnows, Scotch Poacher, Fuzzy Wuzzy's and Matukas are the patterns of choice at the moment. A Mudeye pattern after dark should turn up a few good fish. Best areas to look at in Jindabyne are Kalkite, Creel Bay, Curiosity Rocks, Hayshed and Hatchery Bay. Eucumbene:- With the rising water launching will become progressively easier. Plenty of trolling access from there now. The Love Grass problem has diminished and has made trolling alot easier. Best lures continue to be Tassie Devils in yellow wing and Xmas tree, Merlin deep and Ultra deeps in Trout patterns and Copper Flatfish. Jindabyne:- As in Eucumbene fishing both surface lures and lures on lead core or a down rigger is the best bet for catching a few fish. Reports do suggest deepr rather than shallower is a little more consistent. Gold Stump jumpers have produced some good Browns early in the morning and the other hit lure this week was the F9 Rapala in Rainbow trout colour. The quality of some of the fish has been superb with real football like condition. Best spots to troll have been Sids Bay, Creel Bay, Kangaroo Bay, the bank between Sid's and Kalkite and the islands adjacent to the township. There is and has been some good bait fishing in the area with all bait types producing at one stage or another. Day time fishing in deeper water with Powerbait, Scrubbies or Grubs has produced some nice fish this week with Mudeyes on dark taking fish in the shallower weedy bays. In Jindabyne try Waste Point, Kalkite or the Clay pits.